FoamShield™ foam can be applied for easy removal of asbestos tiles and eliminates the spreading of asbestos particles during the removal process. FoamShield™ has also developed a Mastic Remover which allows mastic to be easily removed without the use of dry grinding. FoamShield™ is the safest, easiest and most cost effective way of demolishing structures affected by fire or structural damage. The Foam Containment System encapsulates asbestos fibres thereby eliminating the spread of the fibres and run off on/from site further contaminating the land or neighbouring properties. 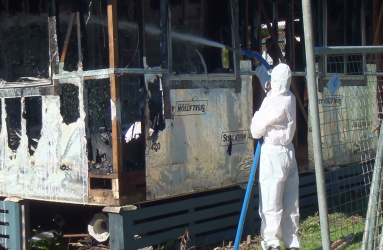 FoamShield™ will put a protective barrier between the debris and workers, and neutralise most biological hazards. Subject to Government approval, and under the new harmonisation legislation we believe that our product can be used to remove friable asbestos from ceilings without encapsulating an entire room. 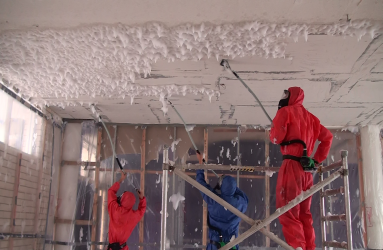 As FoamShield™ foam completely encapsulates the asbestos and no fibres are released during removal there is no need to carry out the timely and costly procedure of full neg air encapsulation. Some maintenance workers carry out asbestos work without the correct control measures in place in the interest of time and convenience. The simple use of a FoamShield™ 4 litre foamer, which is ready to use at a moment’s notice, will put the employer in compliance with regulations, with no added costs such as PPE and containments. FoamShield™ have developed an engine degreaser using green technology. This product is simply sprayed onto areas requiring cleaning and is an efficient degreaser for any industry. Our specialised foam has been manufactured to be effective against a long list of known bacteria and viruses including animal viruses. Examples are Salmonella Enterica, Legionella Pneumophila, Staphylococcus Aureus, SARS, Rotavirus, Hepatitis B & C Viruses and Avian Influenza. For a full comprehensive list please contact our office. Testing is currently underway into producing an effective graffiti and lead paint remover using FoamShield’s™ green technology. 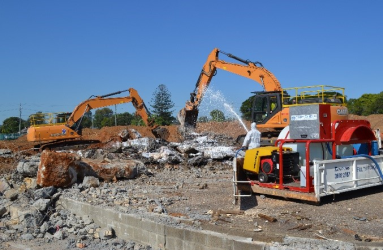 By combining our existing system with microbe technology, we are now able to deliver to you a greener, safer solution for site remediation that will decrease remediation timeframes considerably. Existing methods for hazardous material remediation can be timely, costly and some methods involve the use of hazardous chemicals e.g. oil spill clean ups. This new bioremediation method involves the simple foaming of a contaminated area. This eliminates the transfer of the contaminant from one environmental medium to another by destroying the target chemicals.